Severe socioeconomic distress exists in both urban and rural block groups. Of the 311,000 people in severely distressed block groups, 60% are urban. In rural block groups, as socioeconomic distress increases, so do indicators of environmental distress. 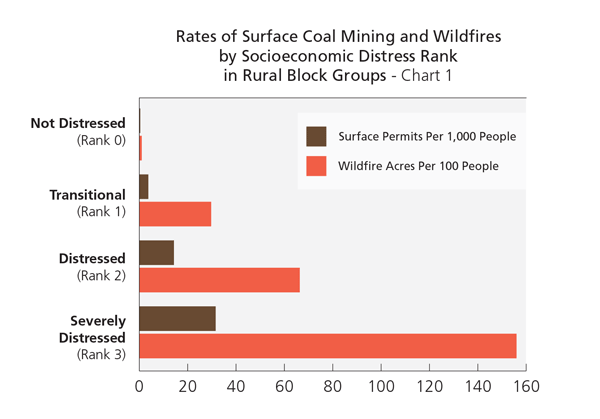 Rates of wildfire and surface coal mining nearly double between distressed and severely distressed rural block groups (chart 1). A broader point can be made with this analysis. Adventure tourism is a growing business nationally and a determined focus of economic development in Kentucky. Many of these types tourists seek a large network of land and water trails, especially in pristine areas. Much of eastern Kentucky had this potential, except for the cycle of unsustainable surface mining and the attending boom-bust economy that left derelict landscapes. Poor areas with scarred lands face a much harder path attaining success in this new tourism. But there is always hope. Perhaps the type of adventures grow (e.g., ATV and bridal parks on large reclaimed strip mines) or maybe regional coalitions stitch together corridors of unaltered land. The benefits are not just in tourism dollars, but also in the activity of recreation. Imagine a distress index map that also included bad health indicators. Map was created by Boyd Shearer for GEO 309, Introduction to GIS in the Department of Geography, University of Kentucky during the Spring Semester, 2015. Kentucky Department for Natural Resources, Division of Forestry. January, 2015. US Census Bureau. 2015. 2009-2013 American Community Survey (ACS) 5-year Estimates. I gave a presentation at UK about how increased adventure tourism provides jobs and economic opportunities to a community as well as influence better environmental care and individual health. Developing more adventure tourism opportunities in eastern Kentucky is very much needed and benefits many dimensions of the region. Thanks for the note!